A person may not even like the taste of white jelly beans….but when you tell them not to eat them, they become the most desirable thing ever. This is my issue right, except insert “onion rings from burger king” instead of “white jelly beans”. And I do like the taste of them, both onion rings AND white jelly beans. You know how I kind of made that big promise to myself, to try really really hard to eat better and work out more? Well, I’m getting ready to work out now-I will probably run out of time to actually get to it because of my procrastinating, but I am at least dressed for it, so we’ll see how it goes. I also said, NO more onion rings!! I don’t eat them every day. Probably has been about once a week though, and that is far too much. So no, I will not eat them anymore. Except, I am craving them. Craving them because I can’t have them….. and it’s not helping that I drove past THREE Burger Kings today. Three!!! I was so proud yesterday, I drove by them as I munched on grapes and carrot sticks. Today, I sulked in my car past the first one. Then the second one. Then I had a problem. I was finished with work, but had about 30 minutes to kill before picking up my son from school. Not enough time to go home and drop off the babysitter, but plenty of time to swing in for some deep fried, delicious onion rings. I was really desperate because I know I lack willpower. I had to do something to avoid driving past the last burger king too soon, or I knew I’d give into temptation. I stopped at Super K-mart instead. 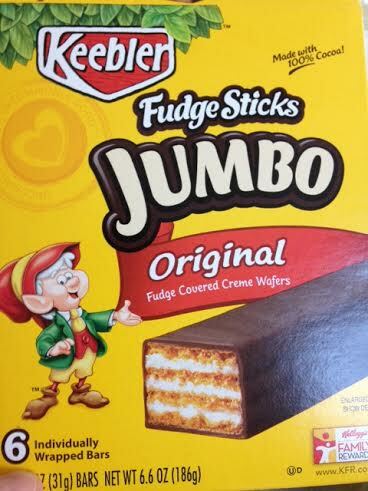 Wandered the aisles, buying underwear for the kids, bleach and Clorox wipes for me, and a box of Keebler JUMBO fudge sticks, for no good reason. I spent $80 to avoid spending $3.00 on onion rings. Then, I still almost gave in, I had ten minutes left, plenty of time for hot grease!! God was kind enough to put a big Semi in my path, directly in front of the burger king. I thanked him, and made it to school without succumbing. Then, as I sat in the car line for 25 minutes, waiting for my son…. I ate two Jumbo fudge sticks. 160 calories each. I could have eaten more. This entry was posted in burger king, diet, humor, onion rings and tagged burger king, diet failure, healthy eating, humor, lack of willpower, onion rings, snacking. Bookmark the permalink.